WITH the mercury topping 38C in Sydney over the weekend (hottest in 78 years), the usual climate ambulance chasers will be sharpening the lead and filling ink wells to inscribe “climate change” “global warming” on their “extreme weather” report cards, feeling morally-bound to fashionably link mankind’s activities to the follies of nature. A heat wave reaced Sydney to-day, causing the thermometers to register 90.4deg. in the shade. This heat, though much less than was recently recorded in the southern capitals, was far more enervating, owing to the huge percentage of moisture in the atmosphere. Mr. Russell says that only a dozen times in the history of the colony has a higher March temperature been recorded in Sydney, and if the lateness of the month is taken into account, to-day’s heat will go very close to constituting a record. In the evening a cool change set in from the south. The mind boggles for SA who are going to incur more mass blackouts, if that’s possible, with the closure of Hazlewood which provided 25% of SA baseload power. Backup coal-fired power from Victoria, on demand, when the wind stopped blowing or it was night time and the SA solar panels went to bed. The only businesses which are bouncing along in South Australia are those selling portable diesel generators, candles and LED headlamps. The sort of staple items you might find on a Doomsday Prepper’s list. However, in Australia’s so-called wind power capital, BYO and DIY power and lighting are everyday essentials. SA’s vapid Premier, Jay Weatherill pretends that he has everything under control. Australia’s Energy Market Operator clearly thinks otherwise. 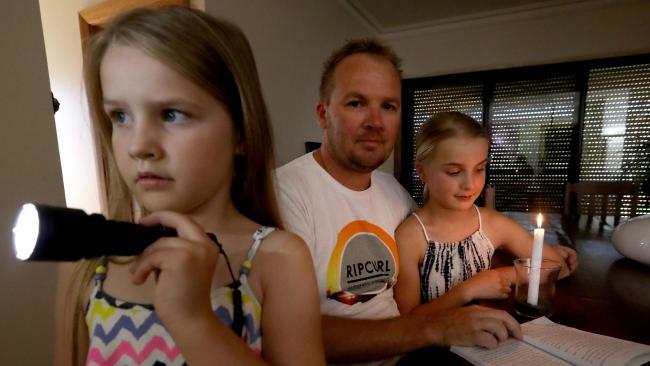 Australia is at risk of more blackouts next summer despite new initiatives from energy regulators and governments, according to forecasts from the Australian Energy Market Operator. The AEMO report to be released on Thursday also warns the looming gas shortage – which resulted in Prime Minister Malcolm Turnbull declaring an “energy crisis” – could still occur if too much gas was exported overseas. By switching from global warming to “climate change” they now blame every weather event on humans, and lack of action by politicians. This provides a mechanism to blackmail politicians. Any weather event like Hurricane Sandy or a hot summer in Australia is now used to pummel local politicians, few of which have the knowledge or integrity to withstand the pressure. That is why a knowledge of climate history is so important, and why I have devoted thousands of hours to studying it. Politicians need to be aware of and be able to cite specific weather events from the past, in order to counter the the endless claims of climate change and unprecedented weather. With the 2014 Australian summer afoot, the usual band of climate criminals have been jumping on the ‘Global’ warming fear-train, drumming up support for their ailing global warming climate change cause. A cause which mother nature has severely battered in recent months and indeed over the past 16 years. Tim Flannery’s privately formed “Climate Council” has led the alarmist charge, spewing out the usual catastrophic weather reports, blaming evil human carbon dioxide pollution emissions on any summer induced bush-fire, hot day or heat-wave that unseasonably rolls through Australia in summer. Global warming sympathetic media outlets, in particular the ABC, regularly cite Flannery’s dire prognostications, whilst omitting valuable climate history. 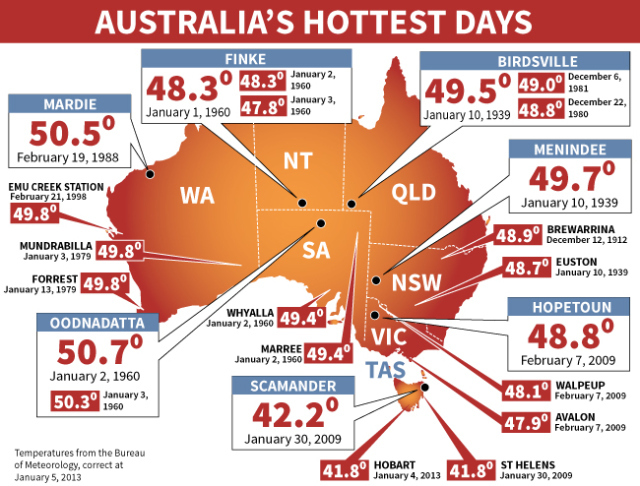 Historical information which tells us that Australian heatwaves are far from ‘unprecedented’. In fact, newspaper reports dating back to the late 1800’s depict heatwaves of at least equal intensity as present day systems. The only difference being, the blistering Australian heatwaves of the 1800’s existed when CO2 was at 280PPM and not today’s 398PPM. In January, 1858 Adelaide had nine consecutive days over 100F, topping out at 116.3. 21 Jan 1905 – SPELLS OF EXTREME HEAT. The graph below compares that to the “record heatwave” during the last nine days in Adelaide. The 1858 heatwave averaged 11 degrees warmer, with every day of the heatwave hotter than the corresponding day this year. CO2 was 280 PPM at the time. Fewer heatwaves for 9 million Australians in Sydney, Darwin, Hobart, Melbourne –”thank CO2″!